Gender equity in contemporary music was the topic of conversation at a recent roundtable discussion as part of Center for New Music’s (C4NM) Trackings Series on January 31st, 2019. The discussion was led by Emma Logan and Julia Barwick of Helia Music Collective; their collective supports and champions the creative endeavours of women throughout the Bay Area. Visibility, commissioning, and performance of music written by women appears to be increasing in recent years, however figures published from fifteen major orchestras still reveal a relatively stark picture: in the 2018/19 season there will be 1,445 concerts, of which only 76 will feature at least one work written by a woman. Of 3,524 works performed, only 82 will be by women. Figures like this highlight the profoundness of the problem. While our discussion did explore the problems themselves, we also addressed actionable paths towards increasing equality. Each attendee of the Tracking Series discussion is progressing gender equity in Bay Area arts. * One example of both measurable and replicable progress was provided by Aubrey Bergauer, the Executive Director of the California Symphony. Under her leadership they have become the first orchestra to publicly commit to diversity and inclusion in all aspects of employment and commissioning, from ushers and board members, to performers and composers. They have pledged that 20% of the works they will perform will be written by women and composers of color, far above the national average of 2%. This not only supports women composers’ careers, but the public nature of the commitment invites other organizations to do the same. The California Symphony has also been a spearhead for inclusion in a number of other ways, including the recent revamp of the application process for their Composer-in-Residence program. This was done by making the application process entirely anonymous, which dissolved the possibility of implicit bias from the application panel. They also refocused their marketing efforts in a way that encouraged more women to apply, and this increased the number of women in their application pool from 5% to 20%. Notably, this increased percentage of women applicants held steady throughout every round of judging. So, with a more diverse application pool, and a decision process that was less likely to allow bias to affect the outcome, the opportunity was more equal. Their latest Composer-in-Residence is Katherine Balch, chosen not by her gender, but by her talent. A common theme in the evening’s discussion was bias, discrimination, and the tokenization of minority groups. Unfortunately (but unsurprisingly), many of the attendees had experienced forms of bias and discrimination. Highlighting the ingrained bias in classical music, Bergauer noted that the California Symphony’s Board of Directors was at first highly hesitant to make a commitment to programing more women and people of color, concerned that the quality of the music would suffer. Bergaur and the Artistic Director had to convince their board that the commitment to high level artistry and programming would only benefit from more diversity. It did, and in fact made their programming fresh, current, and more marketable. Would an entirely white male program be considered an “extra-musical agenda” by this presenter? Of course not. If framed incorrectly, “women composer” concerts may seem like an act of inclusion, but can create a sense that women are being given their special “women’s only” concert, while men have the freedom to be on whatever program that fits their music best. Susie Fong explained that she is frequently mistaken for other female, Asian keyboardists, which demonstrates that minorities are perceived merely as their gender and racial background, while white males can be identified by their artistic personalities and talents. Fong’s experience shows the damaging effects of tokenization, a close cousin of positive-discrimination. Tokenization is a symbolic and often surface level effort for inclusivity, by singling out or “tokenizing” individuals based on their on minority statuses. Mya Byrne noted that transgender composers are often tokenized as exactly that, the “trans composer.” After a trans artist’s work is performed once or twice, organizations sometimes feel that they have done their part and do not feel obliged to continue programming them. This sullies their work’s success in an unfair way, because it suggests that the only reason they have received success is because they are not a white cisgender composer. Unfortunately, this often leads to regression and public withdrawl, as they may not want to face an audience who can only see them as transgender or “other,” and not for who they are as an artist. Byrne also pointed out the importance of creating a queer space in the arts. It is especially important for trans people, who do not have a community of mentors to guide their path in the musical world as cis men and women do. Many icons and elders of the trans community were murdered or traumatized by how they were treated by society outside of their community, so creating supportive spaces for trans individuals to heal and grow is paramount. All of this demonstrates the need for diverse women in positions of power, and the need for safe spaces in educational settings for women, LGBTQ+, and minority emerging artists. A number of attendees at the discussion were educators, and mirrored Byrne’s call for inclusive dialogue and safe spaces for women in the classroom. Former Co-Director of the Center for Contemporary Music at Mills College, Maggi Payne noted the tendency for her older male graduate students to overtake classroom conversation from their female counterparts. Payne enacted efforts to create equitable dialogue, often having private conversations with these male students about the importance of being conscientious and respectful of their female colleagues. Daria Novo spoke about her efforts to champion her female students, encouraging them to try new things and succeed. Educators want opportunities and a sense of exploration for all their students, but Novo recognizes that male students already feel ready to experiment without personal constraints, while female students sometimes need additional support to overcome barriers that society and culture have imposed on them. Educational settings can provide barriers for minority faculty as well. Elinor Armer mentioned that Pauline Oliveros was never able to bring her wife to faculty meetings at UC San Diego, and was prevented from presenting her authentic self in her work place. As a gay women herself, Elinor Armer remained in the closet at work, so that she did not become the “token lesbian composer.” However, she was forced to reveal her sexuality when her partner was in labor and had to let the former San Francisco Conservatory of Music President, Colin Murdoch, know why she would not be at a staff meeting. Fortunately, she was greeted with congratulations, as Murdoch was immediately supportive of her. Colin Murdoch’s support of Elinor Armer demonstrates the importance of allies. Another example is composer and C4NM Co-Founder/Executive Director Brent Miller who refuses to have his work performed on a program that does not feature work by a woman composer. This type of commitment from a cis, white, male composer carries weight and illustrates directly to presenters that programming soley white men is simply no longer acceptable. When any person or organization who has influence speaks up for an underrepresented voice, not only do they create change in that circumstance, but they can leave a lasting impact for the future. Public commitments to diversity in concert programming and employment are powerful. Not only does it encourage accountability, but it encourages others to do the same, (not to mention that it makes concert programing and workplace environments better). Diversity should naturally be built into application procedures and artist opportunities. For example, by changing their composer-in-residence application process, California Symphony increased the number of women applicants (see above) and chose a woman as the winner through an anonymous process. Discrimination and bias still exist today. We heard too many examples of recent discrimination right here in the Bay Area. Create opportunities and support women and minority artists, but take care in how you present them. Talk about them as artists, not about their gender, gender-identity, or skin color. Safe spaces for emerging women, queer, and minority artists are crucial to help the development of the next generation of artists. Allies matter. Use whatever influence you have to support your colleagues. If you see something that isn’t right, or if you have the opportunity to defend someone, it’s your responsibility to speak up. Did you or your organization present an underrepresented voice? Wonderful! Is your work over? No. Sustained efforts are key to truly supporting underrepresented voices. Emma Logan and Julie Barwick, are both local composers who co-founded Helia Music Collective. Emma Logan recently concluded a two-year curatorship at C4NM; her prolific series featured many talented women composers and performers. 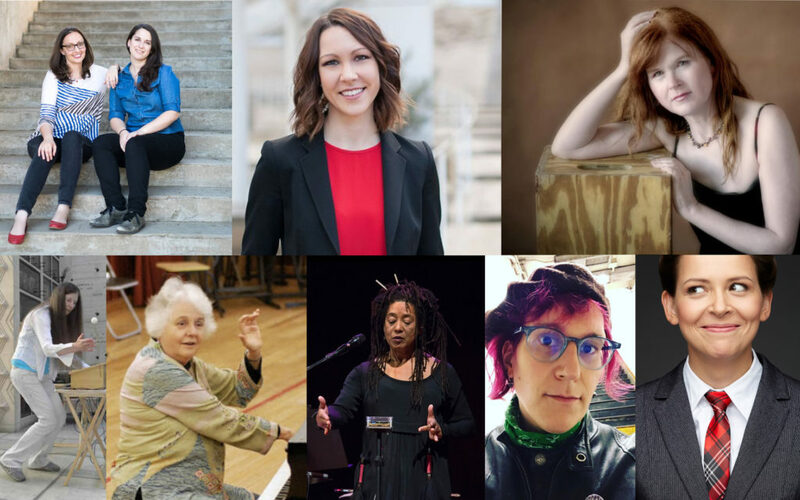 Sarah Cahill, an active pianist and producer is currently touring “The Future is Female,” which features the works of sixty women composers from across the centuries. Singer/songwriter/musician Mya Byrne is currently producing a record that features music written and performed by women. Composer Elinor Armer founded the composition department at the San Francisco Conservatory of Music (SFCM). Armer has taught there for fifty years, and the school is now awarding the Elinor Armer Scholarship to female composition students in her honor. Daria Novo is an active composer and faculty at the SFCM, in the Technology and Applied Composition (TAC) department, where she teaches a private studio that is split equally between male and female composers and is committed to ensuring female students can overcome traditional gender barriers. Novo will soon have a new work premiered at the San Francisco Ballet. Pamela Z, a composer, performer and media artist, has made significant waves in electronic and contemporary music for over 40 years, and has recently received a flurry of commissions, indicative of the changing perspective of commissioning bodies. Maggie Payne is a composer, recording engineer, video artist and educator. She was co-director of the Center for Contemporary Music at Mills College from 1992 until 2018, and her experiences teaching at a women’s college have informed her teaching practices and indicated her the necessity to support women in educational settings. Aubrey Bergauer is the Executive Director of the California Symphony. Under her leadership, not only has she grown the organization significantly, but she has increased the organization’s commitment to equitable artistic and employment opportunities. Soprano Nanette McGuiness is the co-director and co-founder of Ensemble for These Times. Over the course of her prolific career she has championed the music of women composers and recently performed 56×54: But Wait! There’s More! a concert at C4NM featuring 9 contemporary women composers. Amy X Neuburg has been developing her own brand of irreverently genre-crossing works for voice, live electronics and chamber ensembles for over 25 years, known for her innovative use of live looping technology with electronic percussion, her 4-octave vocal range and her colorful, often humorous, lyrics. Susie Fong (keyboardist) and Melinda Becker (mezzo-soprano) are members of Liaison Ensemble, which is comprised entirely of female performers and frequently features the works of women composers from the renaissance and baroque periods. Soprano Jill Morgan Brenner produces I Sing Words: The Poetry Project, a biennial series designed to further the realm of vocal repertoire by commissioning new works, continuing the tradition of art song, and providing accessible new music to future performers and audiences. Brenner is committed to gender-equity in programming and commissions a diverse range of composers for this project.